3 DOOR 2 DRAER WARDROBE. leaving negative feeedback will not solve the issue. The Charles bedroom range is carefully crafted with an attractive oak veneer and walnut trim to create a unique look for your bedroom. This range represents great value for money without compromising on style or quality. Oak Finish inside may very. Includes Hanging Rail,Top Shelf. We at FurnitureRus Committed to bring you best furniture deals online. First image is the actual product from outside, inside may very, internal images are for illustrations purpose only. Lots of storage space in this full 53cm width wardrobe which includes adjustable internal shelving and strong hanging rail. Easy self assembly. 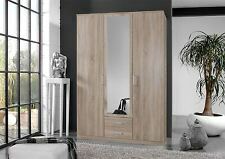 4 You 3 door wardrobe (inc mirror) in Sonama Oak. Lots of storage space in this full 53cm depth robe which includes adjustable internal shelving and strong hanging rail. Easy gliding runners. Adjustable hinges on all doors. 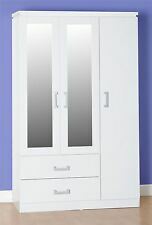 4 You 3 door wardrobe (inc mirror) in Pearl White. Lots of storage space in this full 53cm depth robe which includes adjustable internal shelving and strong hanging rail. Easy self assembly. Adjustable hinges on all doors. These carefully selected Oak veneers are coated in an easy to maintain wax finish which is both an attractive colour and hardwearing. Hanging Rail. We at FurnitureRus Committed to bring you best furniture deals online. Oakworth Oak 3 Door Triple Wardrobe With Storage Drawers. Oakworth 3 Door Triple Wardrobe. Range: Oakworth. Oakworth Oak 3 Door Triple Wardrobe With Storage Drawer / Bedroom / Solid Wood. Material: Solid Oak & Hardwoods. New for 2019 the Highgrove Bedroom collection is a warm and loving country range that features a grey painted body with a natural oak top. All applicable items come with both metal and oak knobs offering both style and versatility. Due to high demand, our popular Dorset collection now includes all your bedroom essentials. Featuring a modern grey painted finish and light natural oak tops this collection is a beautiful range which offers unbeatable value for money. SCANDI PINE BEDROOM FURNITURE. Scandi Pine is a modern designed storage solution. It will comfortably hold a lamp, alarm clock and your favourite book or kindle on top and theres ample storage in the drawers. Kensington Large Triple Wardrobe in Oak. 3 Doors & Mirror. Handle-Free Design. There’s not one but 2 hanging rails in the wardrobe, if you don’t need both just leave one off. To cap it off, there’s a pretty decent sized mirror on the outside of the centre door. Guest room or child’s room, this should cover most of it. Nest of tables. Regal Modern Oak Triple Wardrobe. Blanket boxes. We pride ourselves on bringing you the very best in Oak, Pine and Painted Furniture with an exceptional service to match. We pride ourselves in bringing you the very best in Oak, Pine and Painted furniture with an exceptional service to match. 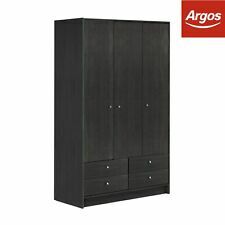 Argos Home Atlas Tall Wardrobe - Choice of 1 / 2 / 3 Door & Colour. Range: Walcot Painted Oak. 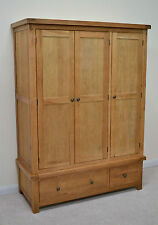 Walcot Painted Triple Wardrobe / Bedroom Furniture / 3 Door Oak Wardrobe / New. Oak Painted Triple Wardrobe. Modern Painted Oak Triple Wardrobe. Material: Oak, Oak Veneers & Solid Hardwood. 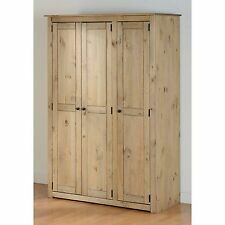 This solid quality built 3 door freestanding wardrobe is sure to be a feature of any room. Enjoy a clutter-free sleeping quarter by storing essentials in this large wardrobe. 2 doors are mirrored to help you get organised and ready. Tuscan Grey Painted Oak Triple Wardrobe. Range: Tuscan Painted Oak. Colour: Tuscan Grey Painted Finish(Colour Matched to Farrow & Ball Elephants Breath). Material: Oak, Oak Veneers and Hardwood. Modern Painted Oak Tripple Wardrobe. Crafted from high quality and carefully chosen oak, this stunning Buxton range of furniture is sure to go unnoticed. Can be mixed and matched with the rest of our Buxton range. Finally, there is also a White Glove service avaiable. The Breton Rustic Oak Triple Wardrobe is the ultimate in bedroom storage solutions. With 3 door width hanging space and two large deep drawers, the breton constance oak wardrobe has plenty of room for hanging suits, dresses and for seasonal clothing storage. The Marlborough Oak 3 Door Wardrobe is the great addition to any bedroom. The right hand side of the wardrobe has 4 shelves. Do not drag the item, it may cause harm to the joints. Marlborough Oak Wardrobe. A beautiful wooden wardrobe, which was purchased from Furniture Village in 2016 for £2,832. Three sliding doors with a mirror. Includes a tie rack as well as two drawers. A great size. We are only selling due to a house move with fitted wardrobes. I will happily take it apart but it is collection only due to its size. A beautiful piece of furniture. Note, we did find that the right door slid open occasionally so we attached magnets to stop this. What makes this Wardrobe a popular choice Wardrobe 3 Door 1200 530 1900. We have been trading online for over 15 years, and been in the furniture industry for generations. We operate from our huge Midlands warehousing facility, with corporate offices located in the city. Sonama Oak. Lots of storage space in this full 53cm width wardrobe which includes adjustable internal shelving and strong hanging rail. Easy self assembly. Can be mixed and matched with the rest of the Amalfi range. Painted in a smart, contemporary sage green with a contrasting oak top for a striking appearance. Crafted to last from oak and oak veneers. 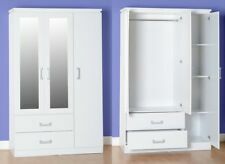 This stunning triple wardrobe has it all covered with a variety of practical storage solutions. Walnut Finish. Includes Hanging Rail,Top Shelf. First picture is the actual picture of the product rest are for illustration purpose only. inside may very. We at FurnitureRus Committed to bring you best furniture deals online. The Windsor solid oak range is a very stylish contemporary and modern oak range. Part of our amazing Windsor Solid Oak collection by Nara Furnishings. It is constructed from 100% solid oak including backs and drawer bases making it far superior to many other oak ranges. Mirrored 3 door wardrobe in Pearl White. Lots of storage space in this full 53cm depth robe which includes adjustable internal shelving and strong hanging rail. Easy self Assembly. W 120cm x H 190cm x D 53cm.